The Mek PowerSpector 550 BTL AOI offers inspection of the bottom and top side of PCBs after Reflow, Wave or Selective soldering and placement of THT & SMT components. 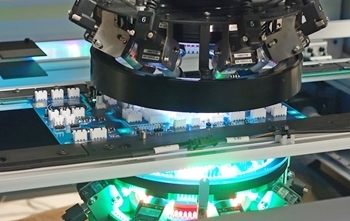 With up to 9 cameras per side (18 total), it is designed to inspect PCB’s inside solder frames from the heavy duty conveyor system suitable for assemblies up to 5kg with a maximum dimension of up to 550x550mm (21.6”). 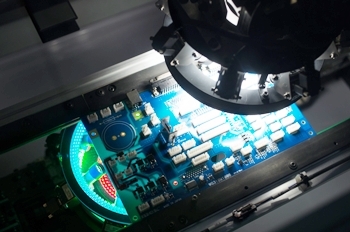 Inspection of PCBs without solder frames is also possible. 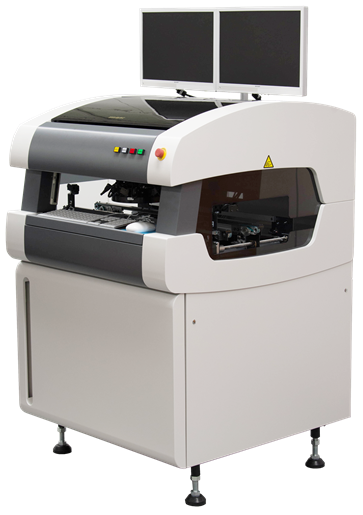 The PowerSpector 350BTL is designed for medium Size PCB’s up to 350x250mm (13.8″x9.8″). The GTAz based bottom side inspection head has a clearance of 30mm from the PCB surface. An additional Z axis allows the head to be adjusted by 30mm to allow optimal flexibility for inspection inside solder frames and the correct adjustment of side cameras. The 18.75u resolution of the main optics and the 13u resolution of the side cameras also give the option for 01005” (0402mm) SMD inspection including height verification of objects like pins and packages, as well as 3D chip height measurement. The GDAz based top side inspection head is specially developed to combine a massive 60mm top clearance with full solder joint inspection via the 3D meniscus profiler. An additional 30mm Z-Axis, with Autofocus option, lets you focus on the top of taller components. The side cameras with 20u resolution can be used to inspect side markings on components as well as verify accurate insertion using height verification. Operator misjudgments of found defects are minimized by the true Image defect display of 9-angle simultaneous microscopic views of each defect found. Typically, 3D AOI’s present defects in a “synthesized 2D” image with synthesized height information. Only the image of the top side of the component is a real image and for an accurate verdict, operators must manually inspect the PCB’s under a microscope for classification/repair. Mek minimizes the risks of damage from manual processes because the defect judgment takes place remotely under the 9 microscopic views in the classification/repair station, without any physical handling of the PCB. The consistent 9-image results, further reduce judgement discrepancies between operators when compared to manual judgment with microscopes. This microscopic presentation of defects applies to both top and bottom sides. Each defect is displayed with a magnification up to 50x (bottom up) or 30x (top down). This minimizes operator handling and reduces time spent on post-classification of defects using stationary microscopes. Because all images can be stored in the Mek’s Catch SQL database, review or post classification can be done any time after the actual inspection. 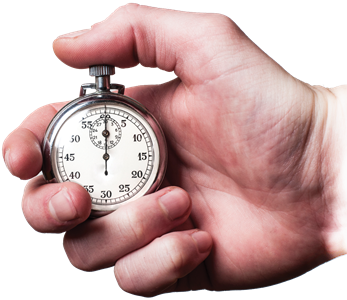 For full tracking and tracing using your own MES system, the Catch system interfaces via its open SQL database or XML outputs. For bottom and top simultaneous inspection, a patented lighting synchronization method allows both heads to inspect the PCB at the same for fastest inspection times but without the high power lighting system of each head affecting the other inspection taking place.